It's your Family's Health and Well-being, so take control today! It’s that time of year when you need to protect your child from the flu season and essential oils are very effective in fighting Colds, Flu and Coughs. Children are probably the most susceptible to picking up bugs and virus at crèches and schools. They play close together and contribute to circulating the nasty bugs. Essential oils are one of the oldest forms used for medicinal purposes helping to combat colds and flu. They are highly anti-viral and anti-microbial. They are more effective than drugs and antibiotics. Did you know that viruses do not develop resistance to essential oils? There are many cold viruses, each with their own styles but they all have a lot in common. Antibiotics fight bacteria infections and will not fight off colds and flus which are virus related. In addition to using essential oils, a good diet can work in harmony. Eat foods rich in vitamins, minerals and antioxidants — these keep your body strong with a healthy immune system. Probiotic rich foods give us good bacteria. They help to boost the immune system and ward off colds and flus. Eighty percent of your immune system is located in the digestive system. This is why gut health is so important for every system in the body. Lemon: Beneficial to the circulatory system and cleanses the body. Supports the immune system. Can cause skin irritation and sensitising in some individuals. Peppermint and Eucalyptus: Cooling and decongesting. Helps clear respiratory, expectorant and aids decongesting. Ravensara: Strong anti-viral oil and expectorant properties. Effective against hepatitis, shingles and herpes. Supports a healthy respiratory and immune system. Niouli: Excellent anti-septic and immune stimulating properties. Used to fight colds, fevers, flu, chest infections, sinusitis, sore throats and catarrh. Lavindin: Similar to lavender, helps to clear lungs and sinuses from phlegm. 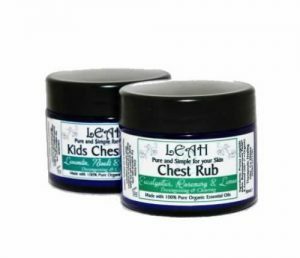 Rub on the chest as often as required, especially when going to bed. It can be rubbed into the soles of the feet also or use as a bath oil, using the steam to help break down mucus. Not for prolonged use. Always do a skin test before using an essential oil. Using an oil burner, add seven drops in total to warm water. Light a candle. Burn in the room you are occupying during the day. Disclaimer: All facts, details & recommendations are provided for information purposes only and are not intended to diagnose, prescribe or replace the advice of professionals. Johann believes that you have the power to control your own sleep, health and happiness. You can make your own educated choices through healthy living, lifestyle, mindset and a good night's sleep. Johann Callaghan is known for helping to empower people to live a healthy and happy life. As an author, speaker and online trainer she helps people overcome their health frustrations by taking actions to take back control of their sleep, health and happiness in workshops, seminars, corporate talks and online courses.